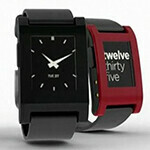 We reported last week on Pebble, the E-Paper watch that can sync with your Android or iOS device. At the time it had raised over $100,000 in just two hours, hitting their target for fund-raising in record time. That was four days ago; after additional press coverage (we can’t take all the credit…) and a strong viral web presence Pebble has now raised more than $3 million dollars – and there’s still 32 days to go! Due to the extra backing, the Pebble project has announced the watch will now be fully water resistant, so you won’t have to take it off when you shower or hit the pool to do some laps. The watch pairs with your phone via Bluetooth, and will alert you to incoming calls and messages from your phone, let you control your music, and have a host of apps for joggers, golfers…heck, check out the video below if you want a glimpse at what it can do. Thanks to the E-Paper display the time is always displayed, and the watch should last up to a week on a single charge. In many ways it’s already well ahead of competing smartwatches, and during the Kickstarter fundraising period you can get one yourself for $115 dollars, which seems like a steal compared to what Sony and Motorola charge for similar products. Where can i buy that,anyone? It's a kickstarter project so if you pledge $115(currently) you'll get the watch and shipped for free. Pledge $125 and you'll get to choose your colors. The sauce: http://www.kickstarter.com/projects/597507018/pebble-e-paper-watch-for-iphone-and-android It's no secret as the author of this article posted it on the bottom of the page but what you do is donate $115 to their company's and product's future and you can get your hands on this lovely digital watch. Be wary of the shipping dates though: September 2012 and International/Canada residents get charged for shipping. Just click on "Pebble" in the source link. I made my pledge, have you? I should add, it cannot display sms messages from an iPhone or iOS device, Android only. iOS doesn't allow that data to be transmitted. This is pretty incredible. I like how the guy at at 1:56 sees his buddy calling and just smiles and nonchalantly ignores it LMAO, how nice. It says right there in the article that because of the extra funding the watch will be waterproof. I don't see how these guys were gonna put this highly sensitive tech in watch form out without it being waterproof. This isn't 1988. Especially something on your wrist that is subjected to the elements on a daily basis. People would be pissed if they just spent $250 on this watch and it breaks because it got wet in the rain. Will it work with my N9?